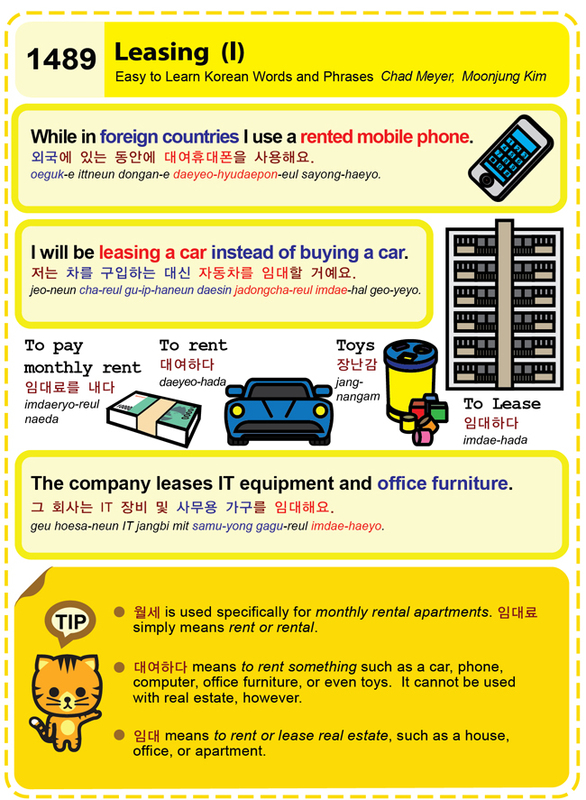 Easy to Learn Korean 1489 – Leasing (part one). Copyright © 2016 Easy to Learn Korean and the Korea Times. This entry was posted in Series and tagged apartment, car, computer, house, I will be leasing a car instead of buying a car., lease, leasing, monthly rental apartments, office, office furniture, or even toys, pay monthly rent, phone, real estate, rent, rent something, rental, The company IT equipment and office furniture is leased., to lease, to rent, to rent or lease real estate, toys, While in foreign countries I use a rented mobile phone., 그 회사는 IT 장비 및 사무용 가구를 임대해요., 대여하다, 외국에 있는 동안에 대여휴대폰을 사용해요., 월세, 임대, 임대료, 임대료를 내다, 임대하다, 장난감, 저는 차를 구입하는 대신 자동차를 임대할 거예요. by easykorean. Bookmark the permalink.